Yes. I’m sitting on top of a rock and it’s quite high, but for the love of blogging, I managed haha! My headband is actually a 10-in-1 accessory. 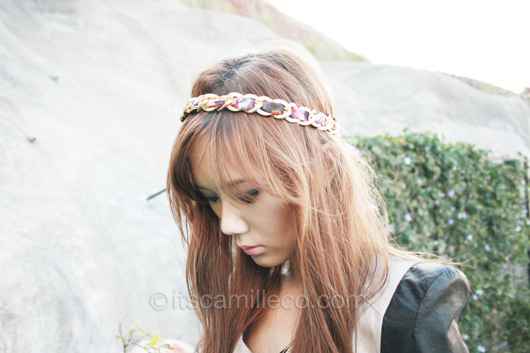 You can use it as a headband, hair tie, necklace, armband, bracelet, belt, anklet, bag strap, bag charm or camera strap. Talk about value for money! :) If you want to get one for yourself, just visit kanditreats.blogspot.com and order away. The accessory is called Jelly Bean and it comes in different colors and prints. Mine is the Tutti Frutti Jelly Bean. (Did I mention how cute the names are too?) I’ve been overusing mine these past few days, mostly as a bracelet. I definitely recommend it, especially the printed ones. Special thanks to KAnDi Treats for my lovely accessory. I wonder if you own or planning to buy some Jennifer Behr headpieces. Her work is just AMAZING! Especially when she works on crystals! Have your ever tried one before? You should consider wearing one on your wedding day! Ang lakas maka-ganda talaga ng headpieces niya! If you’ve seen Gossip Girl, Blair Waldorf often wears Jennifer Behr. Yes I agree! Siguro next time, isa isa lang haha!